Siderophores are a driver of Pinus sylvestris root responses to metabolites secreted by pathogenic and mycorrhizal fungi. Structurally different siderophores regulate the uptake of Fe by microorganisms and may play a key role in the colonization of plants by beneficial or pathogenic fungi. Siderophore action, however, may be dependent on the distribution of Fe within cells. Here, the involvement of siderophores in determining the changes of organelle morphology and element composition of some cellular fractions of root cells in Pinus sylvestris to trophically diverse fungi was investigated. Changes in the morphology and concentrations of different elements within organelles of root cells in response to three structurally different siderophores were examined by transmission electron microscopy combined with energy-dispersive X-ray spectroscopy. Weak development of mitochondrial cristae and the deposition of backup materials in plastids occurred in the absence of Fe in the structures of triacetylfusarinine C and ferricrocin. In response to metabolites of both pathogenic and mycorrhizal fungi, Fe accumulated mainly in the cell walls and cytoplasm. Fe counts increased in all of the analyzed organelles in response to applications of ferricrocin and triacetylfusarinine C. Chelation of Fe within the structure of siderophores prevents the binding of exogenous Fe, decreasing the abundance of Fe in the cell wall and cytoplasm. The concentrations of N, P, K, Ca, Mn, Cu, Mg, and Zn also increased in cells after applications of ferricrocin and triacetylfusarinine C, while the levels of these elements decreased in the cell wall and cytoplasm when Fe was present within the structure of the siderophores. These results provide insight into the siderophore-driven response of plants to various symbionts. The original article has been update: Due to incorrect copyright holder. The online version of this article ( https://doi.org/10.1007/s00425-019-03117-2) contains supplementary material, which is available to authorized users. A correction to this article is available online at https://doi.org/10.1007/s00425-019-03165-8. The first stages of fungal entry into a plant host constitute a complex process regulated by numerous host defense responses, some of which are associated with Fe regulatory mechanisms (Rahman and Punja 2006; Johnson et al. 2007; Johnson 2008; Mucha et al. 2012, 2013, 2015a; Aznar et al. 2014). The specific role of Fe in the host response to mutualistic or antagonistic symbionts in gymnosperm species, however, is mostly unknown (Mucha et al. 2018). Fe and its distribution within host tissues and the rhizosphere have the potential to regulate plant–fungal interactions (Oide et al. 2006; Johnson et al. 2007; Johnson 2008; Fatima et al. 2017). On the one hand, an overaccumulation of Fe can induce hydroxyl radical-related degenerative processes that can damage plant cells. On the other hand, an Fe deficiency can result in widespread oxidative damage since Fe regulates key antioxidant enzymes (CAT, POX, APX, Fe-SOD) that catalyze the detoxification of H2O2 and the dismutation of O− (Marschner 1995). Therefore, regulating both Fe acquisition and its uses is a challenge to fungi when establishing symbiosis, while plant hosts attempt to control Fe homeostasis to prevent fungal spread. Microorganisms possess high-affinity Fe uptake systems for acquiring Fe from the host environment (Johnson 2008). In addition to their reductive Fe assimilation pathway (Ramanan and Wang 2000; Eichhorn et al. 2006), fungi also secrete Fe scavengers (siderophores) under environmental conditions in which Fe availability is low. While Fe scavenging by fungal siderophores can be associated with reactive oxygen species (ROS)-induced damage (Schrettl et al. 2004; Oide et al. 2006), it is also involved in the regulation of endophytic fungal growth during mutualistic associations (Johnson et al. 2007; Johnson 2008; Haas et al. 2008). An inability to produce exogenous siderophores is manifested by a change in the nature of the fungal–host interaction of both symbiotic and pathogenic fungi (Oide et al. 2006; Johnson et al. 2007; Johnson 2008; Fatima et al. 2017). The types of fungal siderophores that have been identified thus far include hydroxamate-type ones, which range in complexity from monomers, dimers, and trimers to cyclic forms that are classified into three structural families: fusarinines, coprogens, and ferrichromes (Renshaw et al. 2002). The trimer forms, such as triacetylfusarinine C, have greater potential to affect plant susceptibility to Fusarium infection (Brown et al. 2017). The production of siderophores is also a mechanism associated with the virulence of necrotrophic fungi (Oide et al. 2006). The synthesis of hydroxamate siderophores has been identified in different mycorrhizal fungi (Szaniszlo et al. 1981; Haselwandter 1995). The strong ability of specific types of fungal siderophores (e.g., fusarinines or dimerium acid) to release free Fe atoms may also be beneficial for plants (Haas et al. 2008). The ability to use siderophores as a source of Fe depends on the structure of the siderophore. In contrast to mono- and dihydroxamate siderophores, trihydroxamate siderophores do not increase Fe availability to plants (Hördt et al. 2000). Thus, the function of siderophores may be associated with both their ability to scavenge Fe and their Fe-binding strength, which are dictated by their structure (Miethke and Marahiel 2007; Dellagi et al. 2009; Aznar et al. 2014). This raises the question of how the Fe affinity of different siderophores and their overall structure may affect the nature of a plant–fungus interaction. Plant responses to siderophores should mirror the defense response activated by fungal stressors. Siderophores can function in two ways during the process of host colonization by a microorganism: they can serve as a virulence factor, supporting disease development, or they can induce a defense response by the host organism (Aznar and Dellagi 2015). Siderophores can alter various physiological processes in plants, including metal homeostasis (Aznar and Dellagi 2015). For example, Fe deficiency has been recognized to cause damage to mitochondria (Vigani et al. 2009). Siderophores can also bind other metals, thus affecting the concentration and distribution of metal-containing compounds that regulate developmental processes (Block et al. 2008). Little is known, however, about how Fe dynamics drive changes in other nutrients within cellular organelles engaged in defense responses. Since roots are constantly challenged by trophically diverse fungi, whether siderophores affect metal homeostasis in root cells, and, more specifically, in cellular organelles, is an important question. Information on the impact of metal binding and release by siderophores on host physiology, especially in roots, is still limited. In the present study, we tested the hypothesis that the limitation of Fe availability itself due to exogenous siderophores influences plant root responses. Additionally, we investigated if structural diversity among siderophores determines the specific response of Scots pine roots. Thus, the use of structurally different siderophores will be reflected in differential physiological and cytological responses in the roots of Scots pine. Additionally, we checked whether the organelle morphology and element composition in different organelles of Scots pine (Pinus sylvestris) roots to the presence of siderophores mirrors the response that occurs during the infection of roots by pathogenic or mycorrhizal fungi. Despite numerous reports on the role of Fe in the process of infection, most have not taken into account the effect of Fe chelation and release on the cytological and functional differentiation of cells in plant organs. The different cellular structures and their specific functions significantly affect the response of plant hosts to invasion by mycorrhizal and pathogenic fungi. The objectives of the present study are to: (i) determine the effects of the application of structurally different siderophores on the levels of Fe in different organelles of P. sylvestris root cells; (ii) characterize the morphology of select cellular compartments, with particular emphasis on the nucleus and mitochondria in response to applications of structurally different siderophores; and (iii) determine the effects of siderophores on other elements. All experiments were performed on Pinus sylvestris roots. Pine seeds originating from Bolewice, Poland (52°28′N and 16°03′E), were surface sterilized with 0.1% HgCl2 (w/v; Avantor Performance Materials, Gliwice, Poland), washed several times in sterile distilled water and then germinated on 0.6% water agar (w/v; Difco). A growth medium described by Ingestad (1979) was poured into 14 cm (diameter) Petri dishes. Half of the solidified medium was removed, and the remaining half was covered with Whatman Grade 1 (Springfield Mill, UK) filter paper to prevent the roots from growing into the medium but ensuring their access to nutrients. Five germinated seeds were placed on the filter paper and covered with cellophane to prevent desiccation. The plants were grown for 2 weeks under fluorescent lighting (Osram L36/W77 Flora; 100 μmol m−2 s−1 for 16 h a day), 60% relative humidity, and a 24/20 °C day/night temperature cycle. The roots were then treated with one of three siderophores: desferrioxamine (the chemical used most often in experiments involving Fe limitation), desferritriacetylfusarinine C, and desferricrocin (at concentration of 0.5 mM for 24 h). The selected siderophores belong to three different families of hydroxamate siderophores: ferrichromes, fusarinines, and coprogens. Fe-saturated siderophores (ferrioxamine, triacetylfusarinine C, and ferricrocin) were also applied as an experimental treatment to determine how Fe limitation itself influences plant roots. Seedling roots treated with water served as controls. Additionally, filter paper overgrown with a 2-weeks-old mycelial mat of the pathogenic fungus Fusarium oxysporum or the ectomycorrhizal fungus Hebeloma crustuliniforme was placed on the P. sylvestris seedling roots under cellophane foil under the previously described growth conditions to compare host cell reactions to different siderophore variants and metabolites produced by the fungus. The plant roots and fungal mat were separated by a particle track-etched membrane (PTM) (The Institute for Nuclear Chemistry and Technology, Warsaw, Poland) that was 10 μm thick and had a 0.2 μm mesh size. This step was performed to allow the migration of metabolites from the fungus to the plant host but to prevent hyphae from growing into host roots. Preliminary studies indicated that the root cap extended 0.5 cm from the root tip. Thus, the first fragment from the cut root was considered the meristematic portion, while the remaining tissue was considered a distal part of the root. The experiments were repeated three times. Sections of roots 0.5 cm in length were placed in a 2% formaldehyde/2% glutaraldehyde solution (v/v) in 0.2 M cacodylate buffer that contained 0.1 M calcium chloride fixative and incubated overnight at 4 °C. The root samples in the fixative were initially subjected to a vacuum for 30 min to remove air from the roots and to ensure that they became submerged in the fixative. The samples were then washed in 0.05 M cacodylate buffer (pH 7.2), further fixed in 1% osmium tetroxide for 2 h and then washed with distilled water, after which they were placed in a 2% solution of uranyl acetate (w/v), which serves as a contrasting agent for viewing the samples under an electron microscope. The material was dehydrated in a series of increasing concentrations of acetone and subsequently embedded in epoxy resin. Ultrathin sections were cut with an Ultracut S ultramicrotome (Leica-Reichert, Bensheim, Germany), collected on 200 µm Cu formvar-coated mesh grids and stained with both uranyl acetate and lead citrate. A Hitachi HT7700 electron microscope (Hitachi, Tokyo, Japan) was used to view the samples. EDS combined with transmission electron microscopy (TEM) was used to determine the subcellular localization of specific elements (Fig. S1). The samples for EDS observation were prepared as described above, albeit without exposure to the contrasting agents (uranyl acetate and lead citrate). In addition, ultrathin sections were collected on Ni grids rather than Cu grids. A Hitachi HT7700 transmission electron microscope equipped with a Thermo Scientific “NORAN” System 7 energy dispersion system (EDX) was used to conduct the X-ray microanalysis. To minimize confusion during discrimination of the different compartments in the plant cell samples resulting from a lack of contrast, we attempted to verify organelles, e.g., mitochondria, under very high magnification to confirm their proper assignment. An area of 0.2 µm2 in diameter was used to conduct the elemental analyses at an accelerating voltage of 100 keV. A signal collection interval of 400 s was used for each point analysis. All experiments were repeated three times with five biological replicates for each of the treatment variables. The effects of the different siderophore structures and the presence of Fe were analyzed by either two- or one-way analysis of variance (ANOVA) followed by Tukey’s honestly significant difference (HSD) test. Pearson’s correlation coefficients were also used to determine the strength of the interdependence of the analyzed elements. Differences between variables were considered significant at P ≤ 0.05. All statistical analyses were conducted via JMP 13 software (SAS Institute, Cary, NC, USA). The cells of control roots displayed an ultrastructure typical of that of root meristematic zones (Fig. 1a). When metabolites produced by either the necrotrophic fungus F. oxysporum or the ectomycorrhizal fungus H. crustuliniforme migrated through the membrane and interacted with host root cells, the ultrastructure of P. sylvestris root cells was strongly altered. When the host root cells were exposed to metabolites of F. oxysporum, several small osmophilic droplets were noticed within mitochondria and nuclei (Fig. 1b), while small vacuoles and vesicles with electron-dense material located in close vicinity to vacuole membrane were observed (Fig. 1c) in the case of H. crustuliniforme. The treatments involving different siderophores also induced several alterations to the ultrastructure of root cells. The alterations were most notably observed when the root cells were exposed to triacetylfusarinine C and ferricrocin siderophores. Mitochondria exhibited swollen cristae (Fig. 1d, e) and numerous internal osmophilic deposits (Fig. 1d, e). Electron-dense material was also deposited in numerous small vacuoles and vesicles (Fig. 1f). Ferrioxamine-treated root cells did not exhibit these alterations, or evidence of these alterations was limited to just a few cells, where electron-dense material was observed close to the tonoplast (Fig. 1g). Notably, electron-dense deposits were frequently observed to be present within cell walls, which was not observed when an Fe-deprived form of ferrioxamine was used to treat the root cells (Fig. 1h). 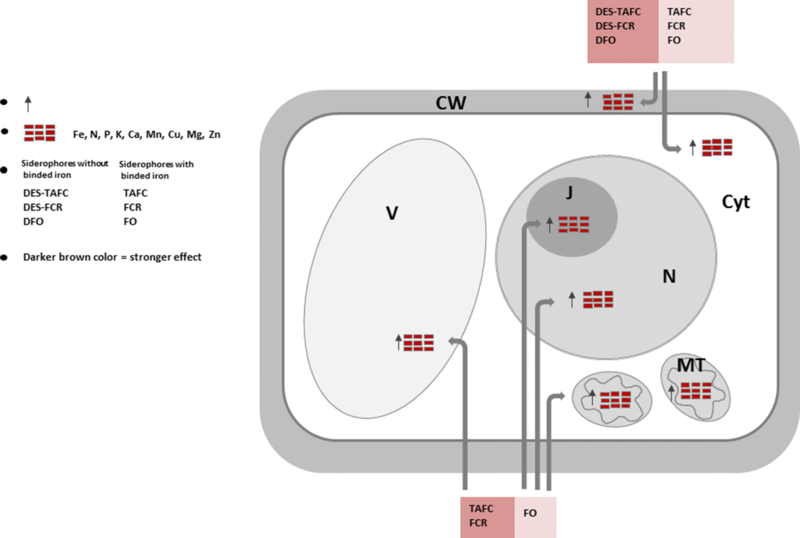 The highest concentration of Fe (P = 0.0003) was recorded in the small cytoplasmic vacuoles and cell walls of roots that were not exposed to fungal metabolites (controls). Compounds secreted by ectomycorrhizal and necrotrophic fungi increased the concentration of Fe in all the compartments of P. sylvestris root cells (Fig. 2). The smallest increase (5–10×) in Fe accumulation relative to that in the control samples was observed in the vacuoles and nucleolus. No statistically significant effect was observed, however, between fungal species or exposure time. The largest increases were observed in the cell wall and cytoplasm exposed to metabolites secreted by F. oxysporum for 24 h, where 33-fold and 19-fold increases were observed, respectively. In comparison, compounds secreted by the ectomycorrhizal fungus H. crustuliniforme caused 23-fold and 15-fold increases in Fe in the cell wall and cytoplasm of host root cells, respectively. Although the greatest Fe accumulation after 24 h was observed in the mitochondria and nuclei of root cells exposed to compounds secreted by the necrotrophic fungus, differences between the studied fungi with contrasting trophic strategies were less visible (Fig. 2). Since structurally different siderophores varied in their effect on cell ultrastructure, it was hypothesized that they would also have different effects on Fe concentration. The results indicated that the structurally different siderophores indeed differentially affected the concentration of Fe within cellular organelles; however, the effect on Fe concentration was independent of Fe-siderophore chelation (Table 1). More specifically, application of ferricrocin and triacetylfusarinine C resulted in an increase in Fe counts relative to those in untreated control samples in different organelles except that triacetylfusarinine C had no different effect from control in the nucleus and vacuole (Fig. 3). Fe count values in roots subjected to ferrioxamine, however, were similar to those in the untreated control samples (Fig. 3). Despite these differences in the analysis of how Fe enrichment of siderophores affected Fe concentration within organelles, only the cell wall and cytoplasm were significantly affected (Table 1). Chelation of Fe to ferricrocin and triacetylfusarinine C resulted in a distinct decrease in the intensity of the Fe signal in the cell wall and cytoplasm (Fig. 4). In contrast, the Fe signal in the cell wall and cytoplasm was unaffected, regardless of whether Fe was chelated to ferrioxamine. The concentrations of other elements (N, P, K, Ca, Mn, Cu, Mg, and Zn) within all studied cell compartments were also affected by the application of structurally different siderophores (see Table 2). Since Fe concentrations may affect the concentration of other elements, changes in the concentration of all of these elements in the cell wall and cytoplasm were also measured. The results indicated that increases in these elements were associated with the application of Fe-free siderophores. The presence of chelated Fe in the structure of siderophores, however, was found to be an important factor in determining the concentrations of P and K.
Increases in the concentrations of other elements were observed, but the increases occurred only in three cellular components: the cell wall, cytoplasm, and vacuoles (Table S1). With the exception of the nucleolus, the strongest relationship between the concentration of Fe and other elements in P. sylvestris roots was recorded after the application of triacetylfusarinine C. Changes in the Fe level in cells induced by this siderophore were also associated with the greatest changes in the concentration of other metals and with P. The weakest relationship, albeit statistically significant, occurred between the concentrations of Fe and N.
Previous studies on leaf tissues have shown that plant responses to siderophores secreted by microorganisms include the binding of Fe present in plant cells (Aznar et al. 2014). Although the potential of Fe to act as an activator or repressor of oxidative injury cannot be ruled out, we suggest that Fe limitation may negatively regulate the organelle response in the cells of Scots pine roots. Fungal siderophores affect organellar metabolism by directly binding the Fe required to undertake normal function. This hypothesis, however, could not be confirmed in the present study. This study did provide evidence that Fe binding to siderophores plays a minor role in regulating the morphology of organelles in plant cells, as siderophores did induce an increase in electron-dense deposits in vacuoles. Siderophores are involved in the suppression of host resistance, whereas free Fe promotes a hypersensitive response, which prevents invading microorganisms from becoming established in host tissues. In Fe deficient condition, root cells were characterized by dense cytoplasm with numerous mitochondria (Schikora and Schmidt 2001). Similar symptoms (cell wall protuberance, dense and rich in organelles cytoplasm) in root cells were also observed under latent Fe deficiency (Landsberg 1994). Fe-deficient conditions have been previously reported to induce ultrastructural changes in mitochondria, and these changes were associated with decreases (Landsberg 1994; Vigani et al. 2009, 2015; Chen et al. 2018) or increases (Izaguirre-Mayoral and Sinclair 2005) in Fe. In the present study, mitochondria displayed less-developed cristae in root cells that were exposed to Fe-free triacetylfusarinine C and ferricrocin, which was regulated by siderophores whose structures differ. Changes in organelle morphology occur as a result of significant shortages in Fe, while changes in the distribution of this element occur rather rapidly. Host resistance to the penetration and establishment of invading fungal hyphae is affected when Fe availability is limited in the cell wall, cytoplasm, mitochondria, and nucleus. Limiting Fe availability in each of these components is crucial to limiting the oxidative burst induced by the invading hyphae. Compared with alterations to overall concentrations, redistribution of Fe in host cells may be a more precise response to invading pathogens (Aznar et al. 2015; Verbon et al. 2017). Studies have reported high accumulations of Fe in cell walls in conjunction with simultaneous depletions of Fe in plastids (Aznar et al. 2014). Thus, colonized plants may experience Fe deficiencies in some cellular compartments but Fe accumulation in others. The results of the present study, however, showed that the application of Fe-free ferricrocin and triacetylfusarinine C increased the Fe concentration within cell wall or cytoplasm (Fig. 4). The increase in Fe accumulation in the cell wall or cytoplasm in response to the applied siderophores may play a role in the induction of the plant defense response. The release of Fe from siderophores resulting in increased Fe accumulation may act as a signal to initiate a physiological plant defense response. Liu et al. (2007) also reported an accumulation of Fe within cell walls, but this accumulation was associated with a depletion of intracellular Fe. Together, an efflux of Fe and H2O2 served as a signal for the upregulation of the transcription of pathogenesis-related genes. In the present study, the application of Fe-chelated ferricrocin and triacetylfusarinine C to roots induced a decrease in Fe signal intensity within the cell wall and cytoplasm. In addition, the appearance of other alterations, such as the presence of electron-dense deposits in cell walls (ferricrocin) and the weak development of mitochondrial cristae (triacetylfusarinine C), were also observed. Alterations in the concentration of Fe may also be a strategy to address pathogen invasion, since Fe can activate the host defense response. Alterations to the composition of the cell wall by the release of Fe would affect cell wall integrity. A similar decrease in Fe levels has been previously observed in the cell walls of Arabidopsis infected by Dickeya dadantii (Verbon et al. 2017). Fe-binding siderophores that release Fe from host cell walls influence Fe distribution and, as such, affect the oxidative burst and transcription of pathogenesis-related genes. The overaccumulation of Fe promotes the accumulation of ROS (Pekker et al. 2002). Assuming that the regulatory activity of siderophores resides in their Fe-binding ability, differences in elicitor activity would be expected by structurally different siderophores. In contrast to the increase in cell wall Fe resulting from the exposure of root cells to Fe-free siderophores, exposure to Fe-saturated siderophores reduced the level of Fe in the cell wall. Differences in siderophore action may be due to their physicochemical properties, such as their lipophilicity and solubility at various pH levels (Winkelmann 2007). 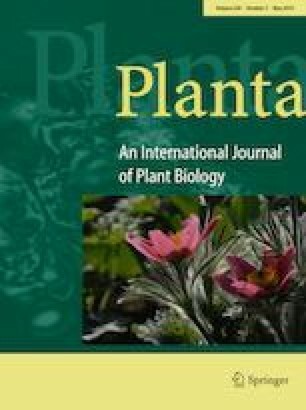 Studies on graminaceous plants that secrete phytosiderophores to take up Fe showed that the siderophores did not cross the cell membrane, indicating that the Fe removal processes occur at the plasma membrane (Bar-Ness et al. 1992). An increased understanding of the mode of action of structurally different siderophores will provide the structural foundation needed to understand how siderophores affect plant defense responses. In our study, structurally different siderophores induced the accumulation of Fe mainly in plant cell walls and the cytoplasm. It is plausible that such increases may be related to the induction of host defense responses when roots are attacked by invading fungi. Fe accumulation often leads to the formation of oxygen free radicals, and plant-fungus interactions often result in increased oxidative injury to plant cells, which benefits necrotrophic fungi. Indeed, necrotrophic fungi need dead cells to serve as a source of nutrients (Mayer et al. 2001). This need is in contrast with that of biotrophic fungi, which utilize living cells to survive in host tissues (Lam et al. 2001). In agreement with this understanding, the hemibiotrophic maize pathogen Colletotrichum graminicola is known to require the release of siderophores for full virulence. The production of these siderophores, however, is specifically downregulated during the early biotrophic phase of growth, possibly to inhibit the elicitation of host immune responses (Albarouki et al. 2014). Compared with mycorrhizal fungi, necrotrophic fungi exhibited increased susceptibility to Fe and a higher tolerance to ROS (Mucha et al. 2018). In the current study, however, an increase in Fe was observed when root cells were exposed to the secreted metabolites of both pathogenic and mycorrhizal fungi, although the level of Fe accumulation was lower in response to the metabolites produced by the mycorrhizal fungus than in response to those produced by the pathogenic fungus. The intensity of the plant reactions over time in response to colonization by fungi depends on the degree of virulence of the isolate. Studies on the distribution of Fe and ROS in P. sylvestris root cells have shown stronger and faster reactions for virulent isolates in contrast to delayed and weaker responses in the presence of other fungal isolates (Mucha et al. 2012). Although it cannot be determined if the current observations are the result of alterations in compounds associated with plant defense responses to a wide range of biotic stressors, releasing adequate levels of siderophores for a given type of trophic fungus may have a significant effect on plant defense responses (see Table S2). Thus, regulating the levels of Fe within specific organelles and other cellular components (cell walls, vacuoles, mitochondria) in response to different siderophores secreted by necrotrophs and mycorrhizal symbionts may be crucial and reflects a precise response to different biotic challenges. The outcome of any host cell-siderophore interaction may be determined by the Fe affinity of the siderophores, the quantity of siderophores produced, and the species specificity of the siderophores (Verbon et al. 2017). Thus, the significance of the change in the localization of Fe observed in the present study remains to be investigated. Due to their great affinity for Fe, siderophores could easily be responsible for inducing the host defense response. As observed in the present study, alterations to the Fe pool, however, may also disturb the balance between different metals and trigger changes in the levels of other elements. Previous reports have demonstrated that the induction of defense responses in leaves indirectly disturbed the homeostasis of Fe and Zn in the roots (Aznar et al. 2014). This indirect signal, which is required for ROS accumulation, appears to induce defense-related hormones such as salicylic acid and jasmonic acid (Aznar and Dellagi 2015). Despite having the greatest affinity for Fe, siderophores can also bind other metals, such as Cu, Zn, and Mn, to varying degrees (Enyedy et al. 2004). The overaccumulation of different metals may alter a variety of cellular processes depending on the metal; for example, the overaccumulation of Cu induces the production of ROS (Suzuki et al. 1996). Many enzymes contain a specific metal at positions important for their activity. Displacement of the essential metal by another may lead to inhibition or loss of enzyme activity (see Schützendübel and Polle 2002). Dellagi et al. (2009) and Aznar et al. (2014) reported that Fe scavenging could trigger an immune response but that Fe-chelated siderophores did not facilitate that process. Fe scavenging appears to be a novel mechanism of immunity activation, involving a complex disturbance to metal homeostasis (Aznar and Dellagi 2015; Vigani et al. 2018). 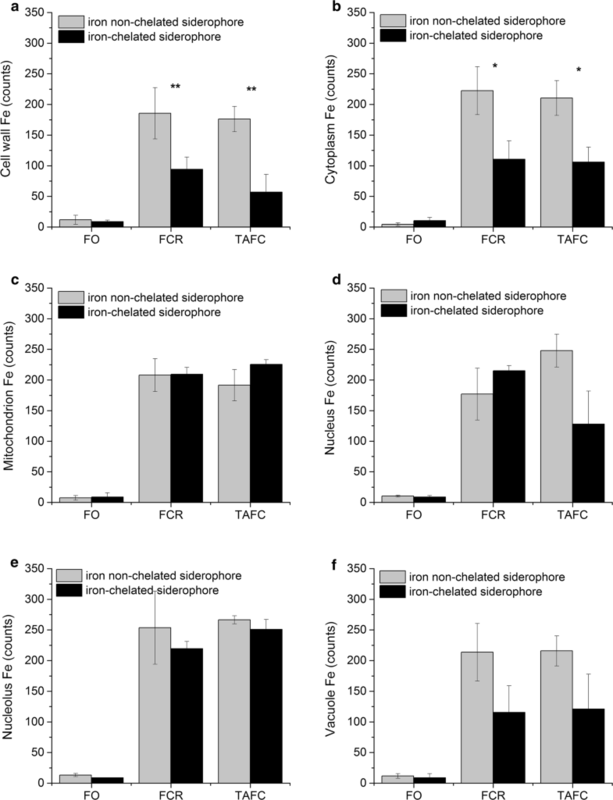 Siderophores secreted from fungi may potentially operate by binding Fe; however, a decrease in the level of Fe in cell walls due to the presence of Fe-chelated siderophores suggests that the mechanism of siderophore action may not be due simply to Fe scavenging. 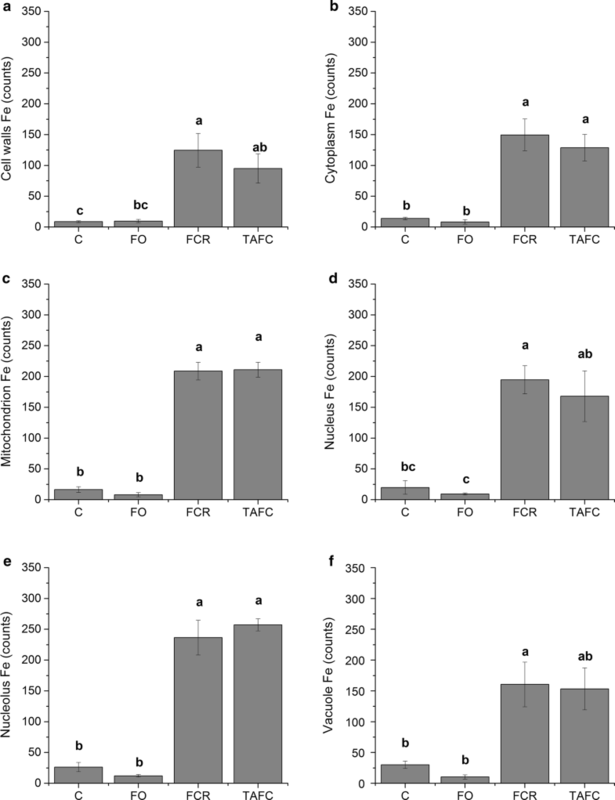 Although the decrease in Fe levels by siderophores does not account for the complete lack of oxidative burst by pathogenic fungi (Mucha et al. 2012, 2013, 2015a, b), the results of the present study demonstrated that the total pool of Fe may play a role in maintaining the symbiotic status. How equal pools of secreted siderophores selectively regulate the host response to necrotrophic or mycorrhizal fungi is unknown. In the present study, both the structure of siderophores and their ability to bind metals affected the levels of other metals and nutrient elements. Alterations in metal distribution or status can rapidly trigger the generation of ROS and host defense responses at the local level. The same alterations in metal distribution or concentration may also result in a delayed secondary response after metal uptake has occurred from the rhizosphere or possibly after the mobilization of metal ions from other organs. Foliar applications of Zn in both inorganic or organic forms were shown to be equally suitable for providing adequate Zn nutrition to wheat plants; phloem transport of Zn from the leaves to the roots was demonstrated (Haslett et al. 2001). To buffer the transient lack of minerals, macro- and micronutrients may by remobilized within the plant. Remobilization occurs mainly by phloem transport, with differences in the mobility of nutrients; e.g., macronutrients, with the exception of Ca (i.e., N, P, S, K, and Mg), are highly mobile in phloem, and micronutrients, with the exception of Mn (i.e., Fe, Zn, Cu, Ni, Mo, B, and Cl), are at least moderately mobile, as reported by White (2012). Structurally different siderophores induced an increase in Fe level in the examined cellular components, particularly the cell wall and cytoplasm. In P. sylvestris roots, host responses and changes in the structure of mitochondria evidenced as weaker development of mitochondrial cristae depended on the structure of the applied siderophores. The mechanism (specifically related to siderophore Fe-binding ability) by which different siderophores affect Fe redistribution was found to operate only in cell walls and the cytoplasm (Fig. 5). The siderophore-activated response in P. sylvestris roots was related not only to changes in Fe levels per se but also to the distribution and concentration of other elements affected by the siderophore treatment. The response of P. sylvestris roots to the application of different siderophores mirrored the response of the roots to the total metabolites secreted by both pathogenic and mycorrhizal fungi, the former of which induced the greatest accumulation of Fe in cell walls and the cytoplasm. This finding suggests that the interaction of siderophores with plant cells induces a plant defense response in host cells. Thus, the universal response of P. sylvestris roots to siderophores may lead to either promoting or preventing the invasion of fungal hyphae by inducing a defense response. As indicated by Verbon et al. (2017), however, both the species specificity of siderophores and their quantity can influence the response to siderophores. JM conceived and designed the study; JM, EG and MZ conducted the experiment; JM, EG and MZ analyzed the data; and JM wrote the first draft of the manuscript. All authors contributed to manuscript revisions. This research was supported by a grant (Project No. DEC—2013/09/B/NZ9/01746) funded by the National Science Centre of Poland to Joanna Mucha and the Institute of Dendrology, Polish Academy of Sciences. We would like to thank M. Guzicka for the help with clarification of Fig. 5. We are also grateful the reviewers for their constructive comments on the manuscript.